From just a pure business stand point, someone decided at Fox News it would be a good idea to bring on the far Left Donna Brazile at the same time they suspend a wildly popular show host in Judge Jeanine Pirro? It's like a double whammy to the core audience of Fox News. What type of business operates like this? Well maybe, it the type of corporation that puts ideology above business- left wing ideology. One America News Network must be loving this. -W.E. Fox News has made no official statement on Pirro’s future with the cable network, other than to say it would not comment on “internal scheduling matters,” as the network abruptly pulled her regularly scheduled Justice with Judge Jeanine show last Saturday night and has apparently canceled this upcoming Saturday’s show. Anonymous sources have filled in TGP and other outlets reputed backstabbing maneuvering against Pirro. Fox’s silence shows a lack of commitment to return Pirro to the air. On Monday, Fox announced it was hiring former Democratic National Committee Chair Donna Brazile as a Fox News Contributor. When she worked for CNN in 2016, Brazile was busted for secretly feeding Hillary Clinton debate questions. Anonymous sources at Fox relayed to reporters at CNN and the New York Times on Sunday that Pirro has been suspended for two weeks for her comments about Omar and a possible conflict between her adherence to Shariah Law, as represented by her wearing a hijab, and her oath to defend the Constitution. 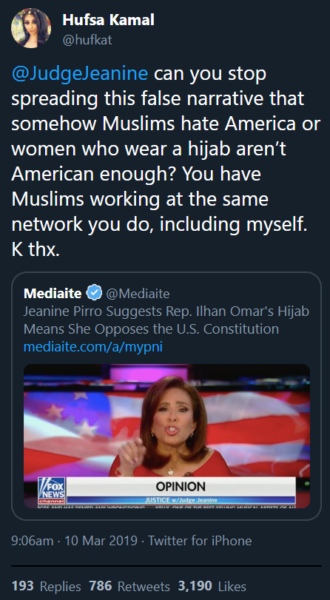 The context of Pirro’s comments was the roots of Omar’s anti-Semitism and what it means for the future of the Speaker of the House Nancy Pelosi (D-CA) and the Democratic Party. Pirro has not spoken out publicly about the controversy since Sunday, March 10, when Fox issued a statement condemning her remarks and simultaneously issued a statement from Pirro explaining her comments. More anonymous sources are now filling the void with reports that Pirro is being targeted by liberals at Fox News. The Hollywood Reporter on Monday quoted a source close to Fox saying executives have never liked Pirro, to explain why the network stood by fellow opinion host Tucker Carlson who has also been under fire–but for remarks he made a decade ago on talk radio. President Trump, a long term friend of Pirro who has appeared on her show several times, spoke out on Twitter Sunday in support of Pirro. Trump also attacked Shepard Smith and two weekend news hosts as better suited for CNN. Text of the only official statements by Fox and Pirro on Pro’s remarks about Omar, followed by video and relevant transcript.